The actress Ilse Bois was already active as an actress as a child. At the beginning of her career she often appeared together with her younger brother, the actor Curt Bois. To her first movies belong "Zwischen zwei Herzen" (12), "Der geheimnisvolle Klub" (13) and "Das verschleierte Bild von Gross-Kleindorf" (13). She also was already busy as a child actress at the theater and she remained true to this medium many years. 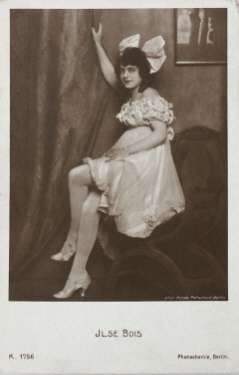 Later she became well-known with her appearances at cabarets, among them "Wilde Bühne" and "Das Kabarett der Komiker". She appeared regular in movies till 1919, to her well-known silent movies of those years belong "Ilses Verlobung" (14), "Das alte Lied" (15), "Titanenkampf" (16), "Ilse, die Millionenbraut" (16), "Das grosse Los" (17), "Bobby als Amor" (17), "Der Bruder der Schwester" (18) and "Ein Patentmädel" (19). It followed a longer interruption and she concentrated to the stage again. Only in 1927 followed her last cinematical work with "Der Geisterzug" (27) directed by Geza von Bolvary. Her artistic career came to an abrupt end in 1933 and as a Jew she had no future in Germany. She fled together with her husband and her brother Curt Bois via Austria and France to Great Britain. Finally she emigrated to the USA in 1936 where she was able to appear again at the theater. So she was able to earn her living curtly. After the war she did not return to Germany, she spend her last years in England from 1946. There she died at the age of 64 in 1960.